It’s still mostly in the 70s and 80s in Baltimore, but winter squash started showing up at the market, so I’m making soup, dangit! This Thai roasted butternut squash soup is inspired by one of my favorite eateries here in the city, Golden West Cafe. Instead of pumpkin puree, I turned to butternut squash that I got from the farmers market. 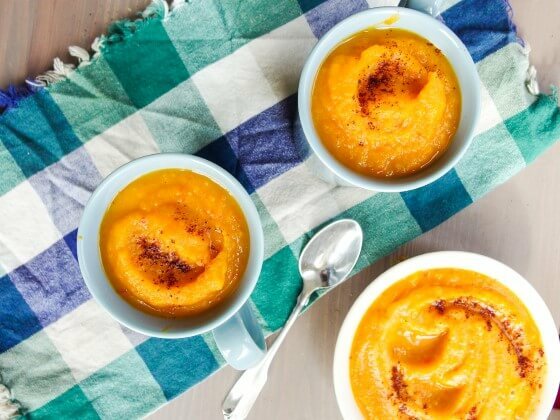 The result was a caramelized butternut squash puree with a silky texture. And thus, my dish became Thai roasted butternut squash soup. That said, the first time I made it I used roasted delicata squash and I’m sure pumpkin would also be great. 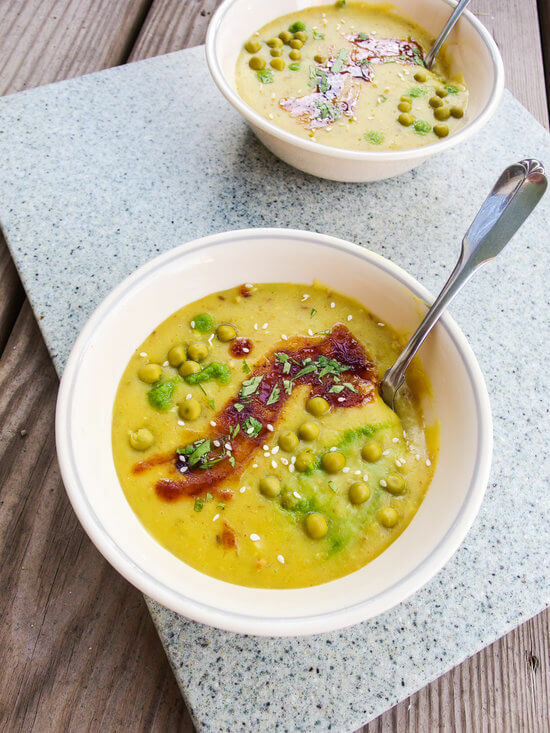 I swapped green curry for Thai red curry paste, because I wanted a little bit of a kick and a vibrant orange color. I burned my butternut squash seeds when I was cooking them, so as an alternative, I quickly toasted some chopped walnuts and almonds in tamari and sriracha. I was pretty delighted with the result and kept it in the recipe! Another thing I love about this soup is that I didn’t need to add any sweetener. 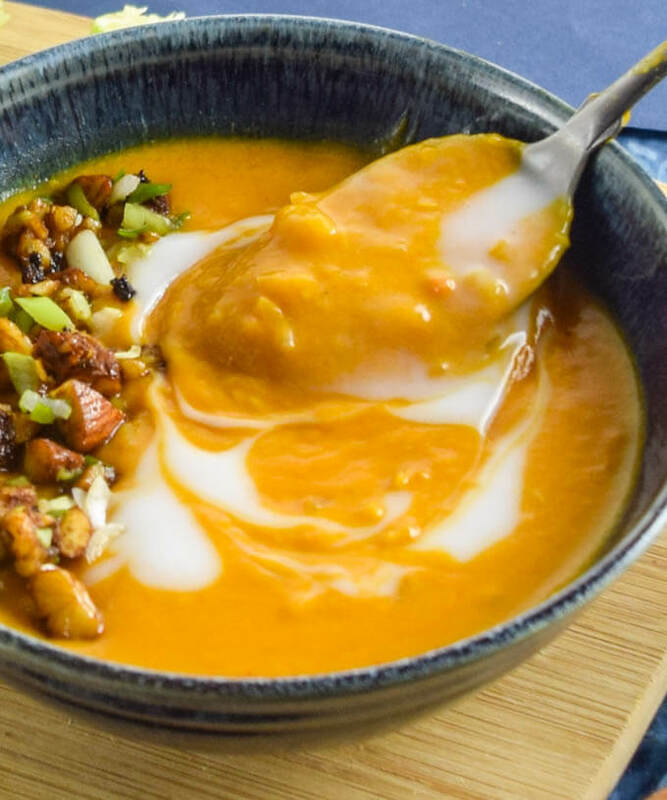 The roasted butternut squash already has a lovely natural sweetness to it which balances nicely against the spicy Thai red curry, creamy coconut milk, and lime juice. 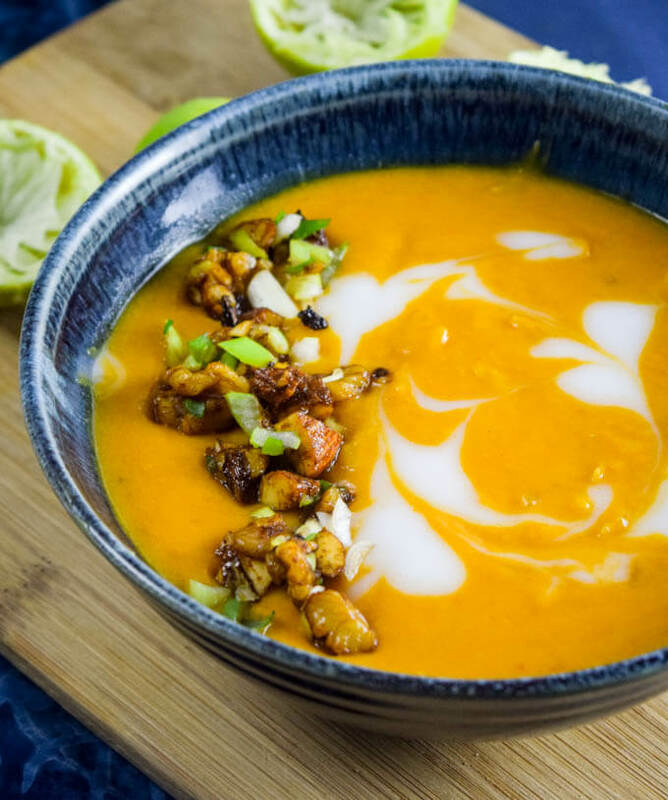 I hope you love this healthy, delicious, easily customize-able Thai roasted butternut squash soup. If you do try it, give me a holler at @yupitsvegan or #yupitsvegan on Instagram, or let me know in the comments. Cheers! 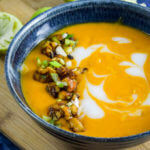 Creamy, comforting, spicy Thai roasted butternut squash soup. 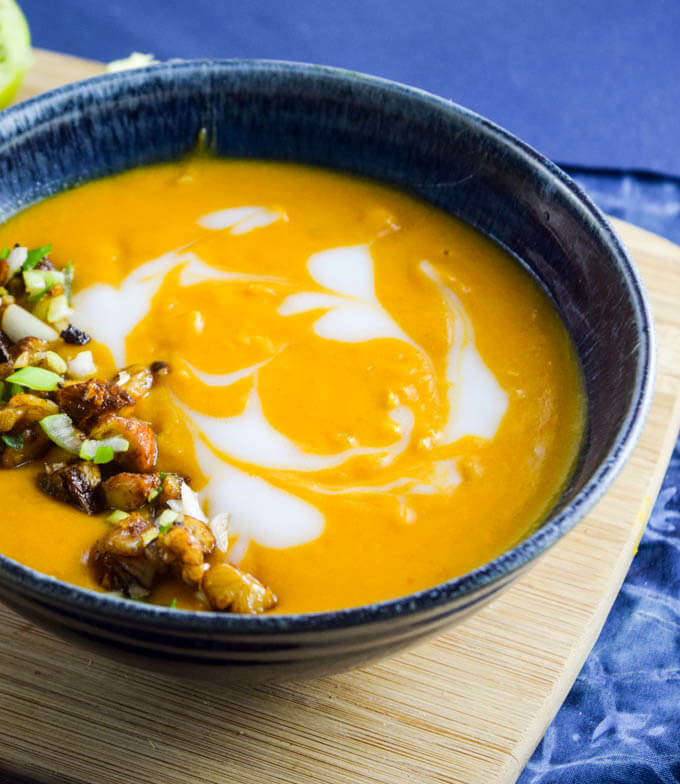 Make the best of autumn's squash in this easy and flavorful recipe. Prick the butternut squash halves deeply all over with a fork. Rub them with a light coating of oil and sprinkle salt and pepper. Place on a baking sheet. Cook the squash, rotating the baking sheet occasionally, until the squash is very tender, about 70 minutes (cook time will vary depending on the size and shape of your squash). Once cool enough to handle, scoop the flesh out of the squash and transfer it to a food processor, then blend until smooth. (If needed to help blend, you can add a little of the coconut milk or broth for the soup). My puree measured about 3 cups. Add the chopped nuts and coconut oil to a skillet over medium-low heat. Stir and cook until the nuts are nicely coated with the coconut oil. Add the soy sauce and sriracha. Continue to cook, stirring frequently, until the nuts are roasted and the excess liquid is gone. Warm the coconut oil in the bottom of a saucepan. Add the shallots and a pinch of salt, and cook for about 2 minutes, until the shallot is softened. Stir in the garlic, ginger, and chili, and cook for 60 to 90 seconds more, until fragrant. If using the ground spices, stir them in and cook for just about 30 seconds until fragrant. Stir in the Thai red curry paste and cook for another 1 to 2 minutes, until the curry paste is coating all of the aromatics and darkened slightly in color. Add the coconut milk, vegetable broth, and butternut squash puree. Stir until everything is combined (you may need to be gentle to avoid splashing, as the squash puree can be quite thick). Bring the soup to a boil and then immediately reduce to a gentle simmer. Cook for about 10 to 15 minutes, stirring frequently, until hot throughout. Stir in lime juice, and add salt to taste. 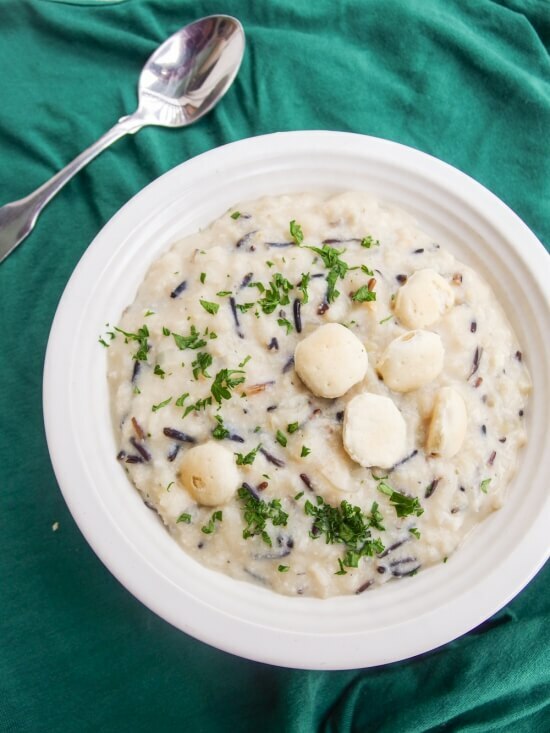 Serve hot, garnished with the roasted nuts, and chopped scallions. Leftovers will keep in the refrigerator for up to a week. 3 cups of pumpkin puree should be a good substitution for the butternut squash. Nutrition data excludes the nut topping. I have this simmering on the Stove now. Delicious! I will make again. This sounds like a fantastic twist on standard pumpkin soup. So many amazing flavours in one bowl! Oh, that sounds delicious !